Today was my son’s first PLAY DAY at our beloved Jackson Heights. Play Day is a line up of field and running events that hosts everything from sack races to long jump to frisbee tosses. The grand finale is the running events which I assumed would be maybe a 50 yard dash for my six year old to conqer. I awakened today with an excited and grateful heart. I had that typical Mom-to-Do list running like a reel in my brain : pack lunches, bring sunscreen, load lawnchairs, and so on and so on. But there was also a reel running in my heart. . . and God reminded me not to miss the miracle of the day. He brought to my mind an angelic, blue-eyed, baby with a head of white angel curls. A baby who began this race of life so far behind where the start line usually is. . . severe lack of muscle tone and significant development delays. . . our race would be slower and longer than we wanted it to be. We would have to work much harder for what seemed to come quite easily for most. So we know what it is like to experience thrilling victories long after the others have crossed a particular finish line. I felt God’s prompting to send our Infant-Toddler Physical Therapist a message and picture of J in his sporty little play day outfit. The message read : “Remember that little baby that couldn’t crawl or walk? 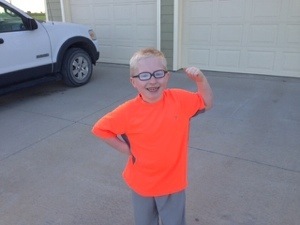 Well , he is pretty jazzed up for his first Play Day at school today” and it featured a picture of him flexing his muscles. And the day flowed with joy and victory as we watched him complete each rotation with a spirit of fun and accomplishment. I thanked God that he was able to fully participate in this day and all the scheduled events it held. We enjoyed eating juvenile sack lunches on miniature kindergarten chairs. I was ready to kick back in my “Big Momma” lawn chair ( I am 9 months pregnant and refer to all of my accessories as “Big Momma” this or “Big Momma” that) and rally around those exciting first footraces of life. It was “ladies first” for the first kindergarten race and we cheered as those little girlies left their starting gate. But there was no finish line in sight and it became clear that the distance of this “little race” was 400 meters. All the way around a standard track. One quarter of a mile. Immediately, a gust of anxiety and fear blew through the halls of my heart. This was a considerable distance for any child of this age. But I heard a very clear whisper in my soul that said “its IMPOSSIBLE for him.” I was panicking on the inside but I stayed calm on the outside. He replied , “Yeah” in a very calm, cool way. He replied, “yeah” in a very calm, cool way. He replied, ” yeah” in a very calm, cool way. And his calmness and coolness made me a little calmer and cooler – – and I marched back to my “Big Momma” chair and peacefully settled in for a race that must be OK because my 6 year old boy who struggles with stamina said it was. Before I knew it, he was on the start line with the rest of the sweet, farm boys he is blessed to have as friends. He took off like a jackrabbit and was right with the pack for about 75 yards. As they rounded that first curve, it happened. He faltered. He began to run out of steam in a way that left him running alone far too early in the race. In fact the rest of the boys were approaching their last straight away before he came to his second. My body immediately carried me out of the chair and pushed me across the football field to where he was on that track. It was weakness and fear that pushed me. It was clear that he was going to struggle.He was going to do so publicly. He may lose his focus, throw a fit, become discouraged that he was so alone in this race. And this experience of lonely failure may mark him forever. I prayed for the strength to withstand whatever this experience was going to be. Without realizing it I began to run along side him on the grass and tell him how important it was keep running and finish strong. I reminded him that this was just like some of those long races he has cheered ME on to run. But it was such a very long way for a man of his size and station in life to run alone. . . I wasn’t sure my swollen self was up to running him in either. And then it happened. .. . God provided him with exactly what he needed to make the journey he was on. His PE coach began to run along side him and say “hey man! Can I run with you?” This blessing of a man kept saying ” I just can’t keep up with you Jackson” over and over again. This was a funny distraction to Jackson and put enough wind in his sails to take him to the last curve. Standing there was his Uncle David and Aunt Ange who began to yell for him continuously- – willing him to round their corner with every fiber of their being. All of his teachers, a nana, a very pregnant momma, some other classmate’s parents, his friends. . .. all walk-jogging with him and demanding victory in their cheers. The stands were filled with older grade school kids and community folks who began to chant “Jackson – Jackson – Jackson” at the top of their lungs. And when he crossed the finish line, he wasn’t a special needs kid who finally made it in. . . He was a mighty champion with the heart of a lion who earned the roar and respect of the crowd who adored him. And he once again became a very real hero to me and a channel for the mightiness of God Himself to reveal his power and provision in all of our lives. My son won a race today. It may not sound like a miracle but when you win a race that you lost. . . well that’s a miracle folks. . . don’t ever want to miss a miracle disguised as an ordinary, every day kind of thing.